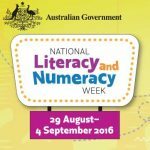 National Literacy and Numeracy Week will be held on the 29th August - 4th September 2016 highlighting the importance of developing literacy and numeracy skills in children. I have created a list of activities to try out in your classroom. Six Word Stories. For some of you who, like me, are not sure what Six Word Stories are, they are literally a made up story using six words. Six Word Stories are a great way to get your students to practice their writing without actually having to write much and explore just how much can be understood with only a few words. They can also be used as writing prompts once the class has written a few each. While doing a bit of internet scrolling I came across this great website that has used really interesting and eye catching designs to tell their Six Word Stories. Participate in Read for Australia on Friday 2nd The 2016 Read for Australia book is My Two Blankets, written by Irena Kobald and illustrated by Freya Blackwood. Get your class to make a blanket by each doing their own quilt pictures and joining them altogether! Going for a maths walk. Plan a route where students stop to explore maths outside. Students can investigate symmetry, measurement, angles and patterning and much more. Use our Measuring Length Kit to practice measuring length and distance. Using drama to enhance learning. When forming groups tell students to imagine they are a 5 cent coin. The students walk around the classroom and call out different amounts. The “coins” have to join with other “coins” to make the correct amount. If any of them can’t make a group then they are the “change.” Use our coin pack for more enhanced learning. If you have any other great ideas to promote literacy and numeracy learning we would love to hear them! This entry was posted on August 22, 2016 by Angelique Cocco.